In meeting with heads of United Hatzalah, leading haredi rabbi says that if it is clear who the terrorist is, don't save him. 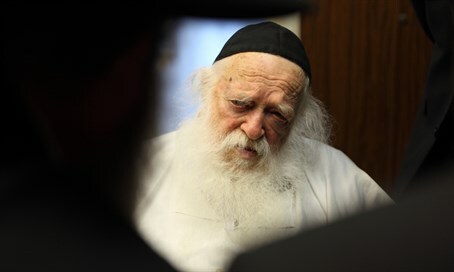 Rabbi Chaim Kanievsky, one of the leading haredi authorities on Jewish law, instructed members of the United Hatzalah paramedic organization not to treat injured terrorists in a meeting Thursday. Heads of the organization arrived at the Rabbi’s house, and after receiving his blessing inquired as to the halachic issues involved in treating terrorists at the site of terror attacks. The Rabbi clarified that in cases in which it is clear to the paramedics who among the wounded is the terrorist, paramedics should not treat the terrorist before those wounded in the attack - even if the terrorist is more seriously injured. Furthermore the Rabbi instructed that if the terrorist was in a life threatening condition, they should leave him or her to die. Having said that, the Rabbi explained that if the identity of the terrorist is not clear, then the paramedics need to treat all of the injured in the area so as to avoid a case in which a victim of an attack would not receive treatment. The rabbi's ruling follows an ongoing controversy in Israel over the issue. The various heads of different emergency paramedic groups have differed on defining the proper ethical practice, with some suggesting paramedics should treat the most seriously injured first - even if it is the terrorist who carried out the attack - while others insist that the victims of the attack must be treated first.